The Red Front Macaw is a relative newcomer, only known in aviculture since the mid 1970's! The Red-fronted Macaw Ara rubrogenys, also called the Red-cheeked Macaw and Lafresnaye's Macaw, is a lesser known macaw. This pretty little parrot is very friendly and one of the hardiest of the Macaw species. Although it was first described way back in 1847, it didn't really come to the attention of aviculturists until a specimen was caught in 1973. The most likely reason it didn't become common is because it's only found in one place, the small Cochabamba valley in Bolivia. This is the smallest of the large Macaws. It could almost be classed as a mini Macaw as it only reaches 24" in total length. Mini Macaws can reach up to to about 20 inches (50 cm) in length, and the Red Front Macaw is just shy of that. Besides its small stature, another characteristic it has in common with the mini macaws is that its not as flamboyantly colored as the other large Macaws. The Red-fronted Macaw is mostly a green parrot, but with some spectacular red accents up front. The forehead, crown, and a patch just behind the eye are a bright red, as well as the bend of the wing. Thus its common names Red-fronted and Red-cheeked Macaw. There are also some bluish hues framing its wings and on the tip of its tail. As a pet the Red-fronted Macaw is very docile and affectionate, but also quite intelligent and inquisitive. Chewing and climbing are favorite activities as well as exploring its surroundings, and even digging in the dirt. They are known to be quite loud however, especially so when anticipating interaction from you! These birds are very social in nature and make wonderful pets. They also make a great aviary bird as they enjoy the company of a flock. Distribution Red-fronted Macaw Ara rubrogenys is also known as the Red-cheeked Macaw and Lafresnaye's Macaw. It was first described by Lafresnaye in 1847. Though there is mention of them in older texts as having been observed as early as 1970, they were first thought to be a simple hybrid between a Blue and Gold Macaw and a Military Macaw. They became known in aviculture as a definite species in the mid 1970's, becoming more readily available in the early 1980's. Like Blue-Throated Macaws, the Red-fronted Macaws are also found in a very small geographic region. They are native to southern central Bolivia between the cities of Santa Cruz and Cochabamba. Their habit consists of arid scrub lands and dry sparse trees in the higher elevations, water is scarce. They nest and roost in the holes of trees and on steep-sided river cliffs,. Their diet primarily includes seeds and fruit, with possibly some vegetable and protein matter. Status The Ara rubrogenys is on the IUCN Red List for Endangered Species as Endangered (EN). A good part of the Red-fronted Macaws native habitat, about 40%, has been converted to agriculture and other areas have become degraded by grazing. As its food trees have been lost, this parrot has become somewhat of a pest to crops. With these changes in their environment and having such a small natural distribution to start with, they are threatened with extinction in the wild. In the pet industry too they are still rather rare. Yet they have proven to be prolific breeders in captivity and are becoming more widely established and available as a pet. 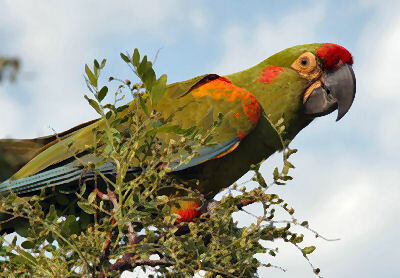 Description The Red-fronted Macaw is also called the Red-cheeked Macaw or Lafresnaye's Macaw. It is the smallest of the large Macaws. They are fairly light green, with more intense green on the head and neck. They have red on the forehead, crown and a spot behind the eye, thus the common names; Red-fronted and Red-cheeked. The bend of the wing and along the front edges are an orange-red. The outer feathers of the wing are a gray blue and the tail is olive green with a blue tip. They have a smaller white to pinkish naked facial area, with the faint brown cheek feather tracings being restricted to just under the eye. The legs are dark gray, the beak is a gray-black, and the eye is orange. Courtesy Darren L Edwardson"Polo is a baby Red-fronted Macaw and he is gorgeous. Very loveable and LOVES to lay on his back in my lap and play. He can be a little nippy, but not hard. He is not loud at all and loves attention. I also free fly Polo indoors and outdoors. This is done only with much training. Do not try this unless you know what your are doing! The Red Front Macaw is a full sized macaw, though they are smallest of the large macaws. These birds are about 24 inches (61 cm) in length. A younger bird under six months old will be missing the red crown and the orangish red feathers on the wing edge. They also have orange under their wings and red on the legs. Care and feeding In the wild the Red-fronted Macaw lives in a rather inhospitable mountainous environment, dry desert scrub lands moving into sparse woodlands at the higher elevations, and water is scarce. They have been observed feeding on corn and peanuts at small local farms, cactus fruits and several native fruits. They eat a variety of seeds, nuts, fruits, commercial pellets, insects and larvae. For the Red Fronted Macaw care and feeding in captivity, there are name brand commercially prepared Macaw seed or pellet mixes. They can also eat anything nutritious that you eat and these foods should be offered. Most parrots enjoy eating with their family. They eat protein in the wild and they do like chicken. Avocado and chocolate are toxic to parrots. HousingA roomy cage is required, at least 2 1/2 by 3 feet, and the bird will appreciate being let out for extended periods. Pet Macaws need at least 2 - 3 hours a day outside their cage. Many birds can spend most of their time on a playpen or parrot perch. As alternatives to a cage, they can be kept in an outdoor aviary where the weather permits, and some people like to provide their bird with its own "bird room". A large sturdy perch needs to be mounted in the cage. Many birds can spend most of their time on a play pen or parrot perch. Macaws are avid chewers and should be provided with plenty of natural branches and wooden toys. Fresh fruit tree branches work great for them to chew on, but then they will have to be replaced occasionally. Food and water dishes, along with a treat dish work best mounted above the perch at the side of the cage. Social BehaviorsIn the wild the Red-fronted Macaw are very social birds, though generally few birds are seen at a time. In captivity, these birds are lovable, friendly, and intelligent. They are also fun little clowns. They love to play around and can be quite mischievous. Red Front Macaws can be quite loud, being especially loud when anticipating interaction with you. They are a very social bird and enjoy the company of their flock or of a mate as well. They love to dig in the dirt and are quite inquisitive. They can be a good family type bird. They are a gentle bird that will get along with more than one person, although they will probably have a preference in the family. But they are a typical Macaw and can be cranky at times and may prefer only one person or only one gender. They will also mirror your moods, so if you are agitated, they can become agitated. If you are happy and loving, well so is your pet. To have a well-rounded bird that enjoys more than one person, make sure it is well socialized with lots of folks. Handling/Training The Red-fronted Macaw adapts quickly. Once it becomes accustomed to a new environment and its keeper it is then ready to start bird training. Generally though, you should give a new arrival a few days to get use to you, your voice and its cage before trying to handle it. A hand fed baby will not need much taming and can often be handled right away, as it is use to human attention. Sexing - Sexual DifferencesNo visible differences, though it has been stated that the males may be slightly larger. Yet there is no certain way to distinguish a male Red-fronted Macaw from a female. In order to know whether you have a male or female, the bird must be sexed. DNA / Feather or surgical sexing is recommended. Breeding/ReproductionIn the wild the Red-fronted Macaw will build its nest in holes of trees, or on steep-sided river cliffs. They were first bred in captivity in 1978 (1981 in the United States), and are found to be prolific breeders. The usual clutch consists of two to four eggs which incubate for about 26 days. The babies will fledge after about 3 months in the nest. Feed the parents additional high-fat seeds, like sunflower seed, during the breeding season. The young will also require a high-fat diet as well as additional protein. This Red-fronted Macaw has been crossed with another large macaw species, the Blue and Gold Macaw, to develop a first generation (F1) hybrid Macaw,called the Maui Sunset Macaw. It has not been hybridized with Mini Macaws. Potential Problems It is definitely true that a Red-fronted Macaw can make noise, but it is not often, and not without some provocation. Usually if a Macaw makes a loud squawking noise, it's because they perceive something to be wrong or different. Maybe a car they don't recognize is coming to the home or the dog is loose. They are also known to make a noise for about 10 minutes as the sun is setting. This is an alert to their flock to settle in for the evening. If you notice any of these bird illnesses in your Red-fronted Macaw immediately provide a warm, draft free, secure environment kept at about 86°F (30°C). Place food and water close to the perch where it is easily accessible. An ailing parrot should be taken to an avian veterinarian for diagnosis and treatment. Availability:Red-fronted Macaws for sale, though still rather rare, are becoming more available due to successful captive breeding. Though once they were among the most expensive of the Macaws they are less expensive now, more in line with the readily available species. I am interested in purchasing a 6 month - 2 year old male Red Fronted Macaw. I live in Houston, Texas and will pay shipping fees if necessary. I'm looking to adopt a 9 to 12 year old DNA tested male red fronted macaw. I'm in Woodstock, VA and will pay for a shipping cost on a pet flight if necessary. I have several females within that age range. I would love to have some parent raised chicks to add to the flock. Please contact me at lauritztj@frontiernet.net. I recently rescued a nine-year old female Red-Front macaw named Sam, and I love her!! Her previous owners did not understand her so she never had a chance to thrive and blossom. She does now, and boy is she ever!!! She is a very loving, very entertaining addition to my family. I too own a red fronted Macaw, a male named Gus who has a great personality to match his name. He is three years old, and is very affectionate, he is just getting to know us, I was suprised that he was so easy to work with so soon after buying him and taking him home. My boys cousin last week told us that he has this bird that he's soo tired of he wants to get rid of it.. I was like what kind of bird? He didn't know. He said he has had it for five years. Also he told me that he bought it off a guy that had it for 10... I was like that's an old bird so I was curios about the birh gold him I'll be at his house . So I went and saw that it was a Macaw. He was soooo mean to the Macaw I was in a instant telling him that I would take the bird then and there! He had told me that the Macaw escaped one summer ago and flew to a neighboring tree and he used a stick and wacked it down... =:(now that I have her, I found out it's a she, her name is Joe had her for two days. I've been reading about her none stop. But other then that I would love it if u guys helped me out with her on some advice. The red fronted macaw is a very very sweet macaw. They love their humans. They are a lap bird and will follow you all around the home. She will probably need some time to adjust and know that she is safe and then she will come to you and they are extremely affectionate. Yes, my human had a couple for years for her friends. They LOVE pine nuts. I think it is the staple of their diet in the wild, if I remember correctly. They love them so if you need to give treats to train - you can use pine nuts or cherios. The love pet and hold. Just learn their body language and i am sure she will train you properly. They are not normally a noisy bird and their life expectancy is around 50-60 years. Have fun and enjoy. They are extremely loving.